Blackheath near Greenwich in South London, I stopped to get breakfast for the crew. The Blackheath Tea Hut is exactly that, a hut on Blackheath selling tea (in addition to bacon sarnies, egg rolls etc.) The power of electricity has not spread to this makeshift foodshack, nor had the technology of a cash register so a hand written receipt would have to suffice. Imagine my delight at seeing the £11.80 scrawled beautifully under 'TOTAl'. Genius. With a nod and a wink, I went on my way - fed, watered, and warm inside. hahaha... I love this site. Just wanted to let you know that the blackheath tea hut has a website now! 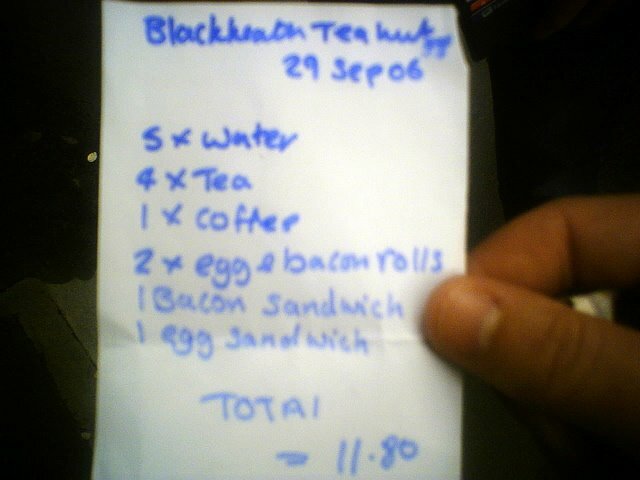 Go to www.blackheath-tea-hut.co.uk to have a look. You can support the hut by signing the guestbook with your comments.